Enjoy some creamy bacon goodness! You are familiar with bacon, right? Okay, you looove bacon, right? Now imagine there would be a way that you could have that smoky delicious taste of crispy bacon but in a convenient way to use it whenever you want – right from the fridge! But if you could cook that bacon to perfection and add some onion, garlic and honey, then it would become even better, right? Now imagine you would cook this up and then blitz it up in your kitchen machine! But it’s spreadable bacon! The most convenient, awesome spread that has been ever invented! I can’t take credit for the idea of bacon-jam*, but I sure like to have it at hand whenever I crave bacon! (which might be a bit too often). And as it’s already a spread you can also add it to dressings, mayo, even soup! It makes a great basis for a pasta sauce if you just add some diced tomatoes to it. And toasted bread never has seen a better friend than bacon-jam in its life! Give it a try! I promise that you won’t regret it! Creamy bacon spread good enough to put on practically everything! Black pepper and Tabasco to taste – I like all my food spicy! Let’s blend up some tasty bacon! Heat a large frying pan to medium high heat, while you cut the bacon rashers in half or in thirds depending on the size of your pan. Render the bacon rashers in the pan until they are crispy, turning once or twice. While the bacon is cooking, finely dice the onion and the garlic. Peel and grate the ginger. Remove the bacon rashers from the pan and place them on a plate lined with kitchen towels. Add the diced onion to the bacon fat and fry until translucent. This takes about 5 minutes. Add the garlic and the ginger to the pan and stir-fry for about 1 minute. Drizzle the pan with the honey, add the cloves, a generous amount of pepper (and optionally Tabasco), as well as about 50ml of water. Cover the pan with a lid and let simmer on low heat for about 1 hour. If your onion jam is getting to thick add another splash of water. In the fridge your homemade bacon jam will hold for about a week if placed in a well sealed container. It also freezes very well! Smear your bacon jam on everything that could use a little more bacon in its life! Let me know what you think about the recipe in the comments below! It feels really weird to pulse the bacon, right? 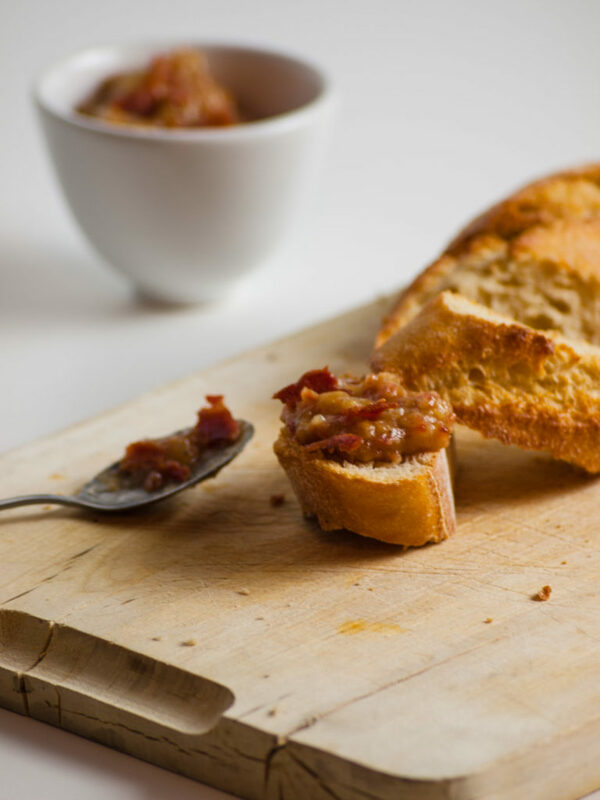 I share that feeling… do you have suggestions how to make this bacon jam even better? And most of all I’m curious: What do you use the bacon jam on? Next Post When in Prague, thou shall eat sausage and drink beer!